Discussion in 'Guides and Tutorials' started by Donhonk, Aug 19, 2014. 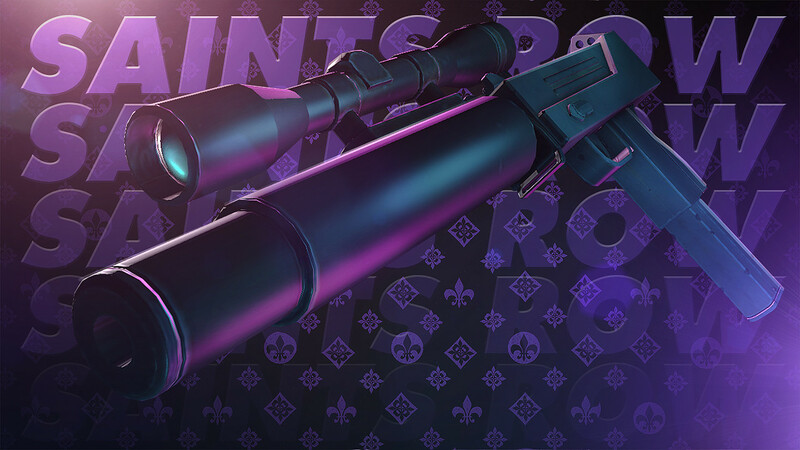 Replacing existing weapons in Saints Row IV with a custom model and new textures. NOTE: The replacing of existing assets are temporary. Volition is working on a modding patch for Saints Row IV that will allow the loading of entirely new assets without replacement! No ETA as of yet, but get hyped. Adding new animations to weapons. Download the latest SDK Release A and the latest version of the FBX converter from the release thread. For the following items, I haven't tested it personally, but if you are on a 32 bit operating system, download the 32 bit versions of each program if applicable. Grab the one named "wxPython3.0-win64-py26"
Install all 3 programs, with Python 2.6 being installed first. Finally you need to copy some files from the FBX 2014.1 SDK directory to your Python 2.6 directory. This link from Autodesk explains it pretty well. 1) Notice the Wx folder and local files that should have been installed here. 2) The fbx files that you should have copied over to this folder. *This download is technically optional. This is for those of you that would like to replace weapons not included in the templates. Extract your ‘templates’ folder. These folders have examples of each weapon style in the game. These FBX files contain everything you need to make a weapon replacement for Saints Row IV. The templates include several things. 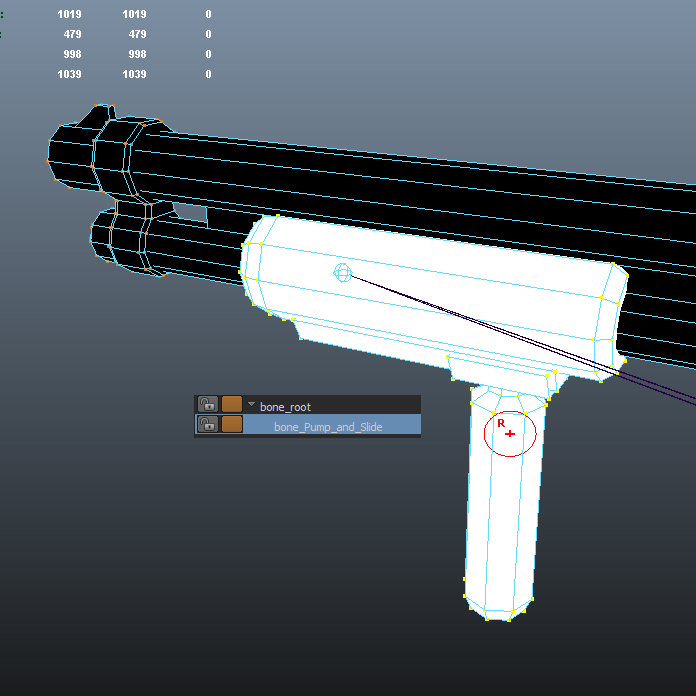 First the mesh for the main gun, clip (for some weapons) and then bones and locators. I've laid out the specifics of each below. In the case of the Pistol template, 'Pistol_Police_A' is your weapon. Currently it is skinned to the bones, and has a shader applied to it. The name of the mesh is important to note, this is what you will need to name your new mesh. The name of the mesh is also used by the converter to name the files. 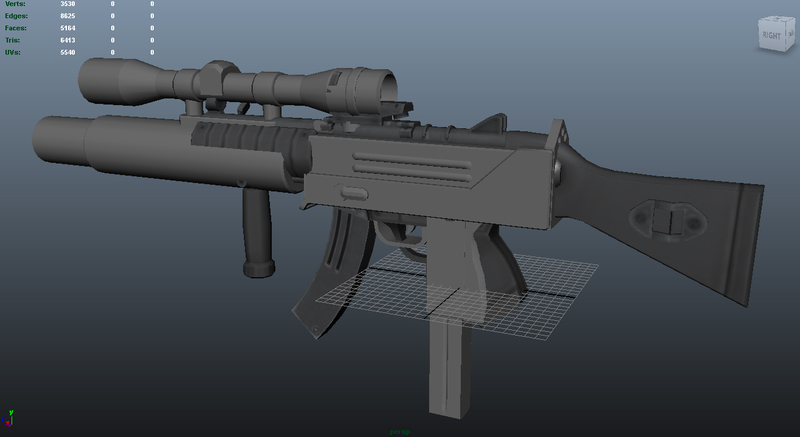 Some of the weapons have an additional mesh, which is either a clip or a projectile. In this case we have the "pistol_police_a_bone-clip" mesh. These have the same shader applied to them as the main weapon and are not skinned to a bone. 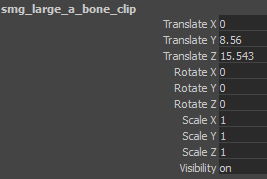 Bones are used to specify what areas of your weapon animate. The names are usually pretty self-explanatory. When you rig the skeleton to a new mesh, it will animate in the same way as the template weapon. 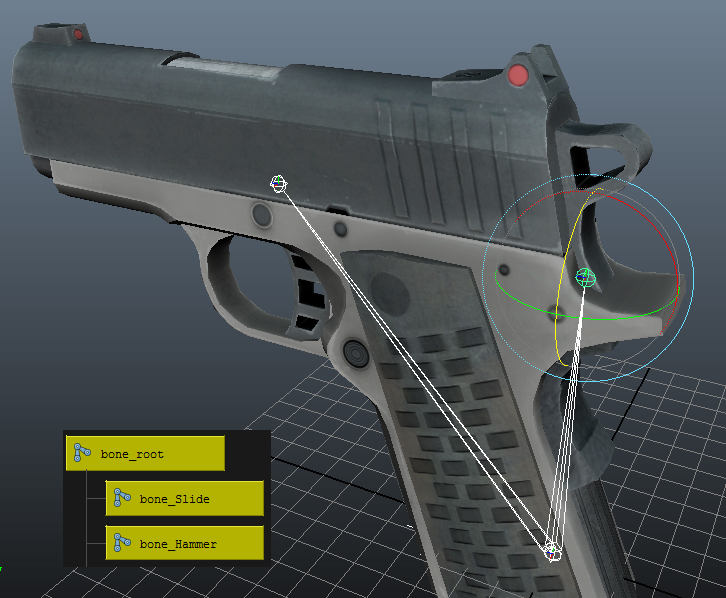 For example, the slide bone on the Pistol template moves its skinned vertices back in the Z axis when fired. Another example is the Mine Launcher's BlueCanister bone, any vertices skinned to it will rotate in the X axis. There is currently no way to change how these bones behave, and weapons can only use bones they originally had. Bones also have a couple extra attributes. These are necessary for the bones to be properly read by the game. You likely won't have to bother with these settings since they are already set correctly in the template files. Attachment tags are null objects that define where attachment points and various effects like particles are located. Tags are defined by name, with the prefix of 'tag_'. The templates contain all the tags for that particular weapon, so all you will need to do is move their position to the appropriate place on your new mesh. 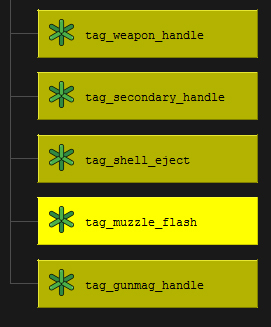 If you want to replace some of the other weapons not included in the templates, here are some mandatory tags that we can use. Listed below. NOTE: Currently we don't know the other tags and bones that the other non-template weapons have. But it is in the plans to provide the rest of them in the future. Basically, you can replace all the weapons currently but until you know the correct bone setup and tags, you can't replicate all features. For example, you can replace the Tentacle Bat, but it won't have the physics because we don’t know the names of the bones and locators. The template files have been created from source files from the artists at Volition. 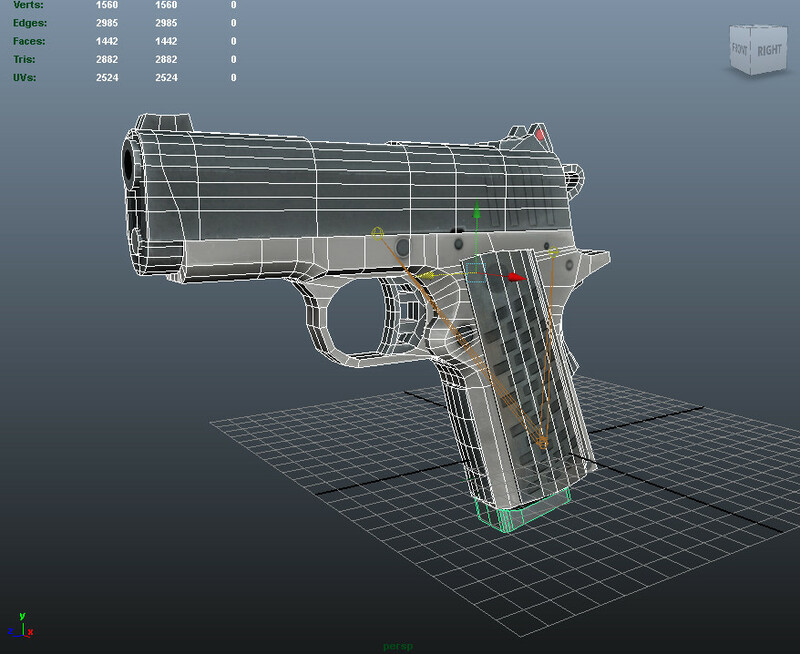 Above: Pistol’s Shader opened in Maya’s Hypershade. Textures are assigned using Maya / 3DSmax shader network. Textures need to be saved as .TGA format. Converter Supports Diffuse, Normal, Glow and Specular Maps. Converter does not currently support multiple materials. Texture names need to follow a set naming convention for the FBX converter to be able to find them. The naming convention is laid out below. LG = Large Texture used for up close. Your diffuse texture for texturename_SM_D.tga should be 512x512 pixels in dimensions. Your LG normal and diffuse should be 1024x1024 and your LG specular map should be 512x512. Keep in mind that you don't necessarily need anything but a diffuse. Textures need to be in the same folder as the FBX. STOP: At this point we want to create our FBX. And once you are done, come back to this part to continue. Now launch the FBX converter. I'll lay out what it does. 2. This dropdown menu lets you select between each mesh in your FBX, in this case we can select the main weapon mesh and the clip mesh of the Police Pistol. 3. 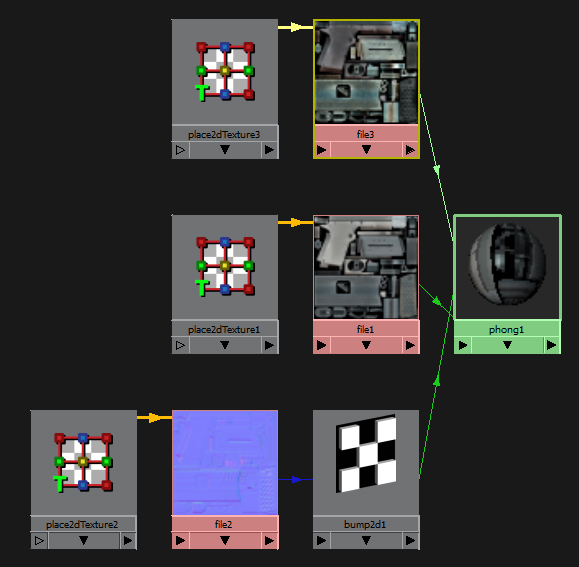 Select 'ir_at_bsimple1' as your shader. The rest of the shaders aren't supported / documented. 4. These toggles enable export / converting of various file types. You want to enable all of these for your main mesh. 5. I will talk more about packaging in the next section. This is our last step when making a weapon, and this button will take our crunched files from step 4 and package them up for the game. Again, more details in the next section. REMEMBER: If you are making a gun with a clip / projectile, it most likely had a dash in the name. Maya doesn't preserve dashes in the name, so right now is the moment to change the underline to a dash. So, you've imported your FBX, and you've enabled the buttons detailed in 4. Now all you need to do is hit convert! 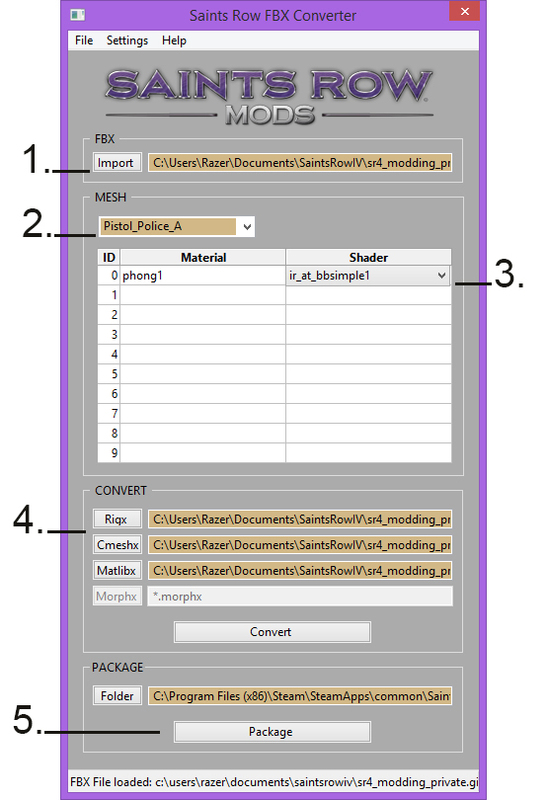 Create a folder named packaging, inside a folder named Modding. Packaging is where you put the STR2 / ASM files of your chosen template. All you have to do is copy and paste the files from the 'Packfiles' folders included with each template as seen below. Back in the converter, hit the folder button and select your packaging folder. All you need to do now is hit Package! If all went correctly, then you will have your modified files in your packaging folder! 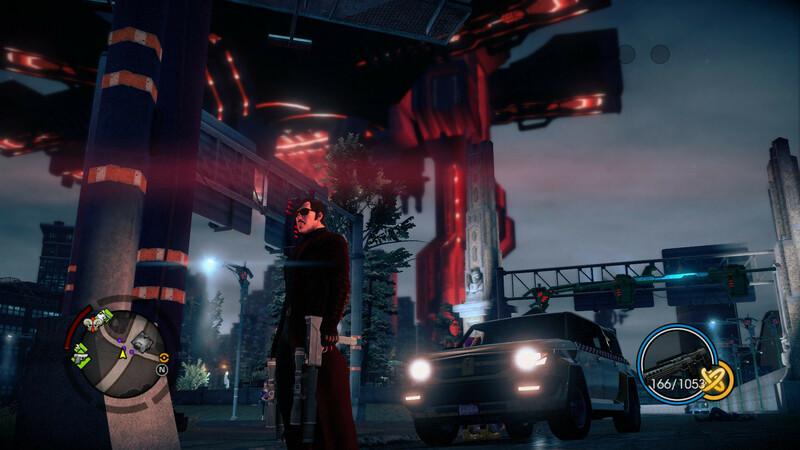 Take them and shove them in Saint Row IV's root folder (C:\Program Files(x86)\Steam\SteamApps\common\Saints Row IV) and launch the game! If everything went right, your new weapon will replace the default model. Celebrate! Lukong1515, Nordlys and Corrodias like this. I won't be covering the actual details of modeling, because it is a gigantic subject to cover. If you are new to modeling I'd highly suggest seeking out the myriad of free and high quality tutorials available around the internet. A good place to line up would be the trigger area. Grips should be roughly the same size. 4. Overwrite the default textures of the SMG_Large_A with your own. Make sure your images are the same size as the defaults. If you are utilizing all the features of the shaders you will make a diffuse, normal, and specular map. 4. Open the Hypershade. To lay out the materials like above, hover over Phong1 and right click drag down to select graph network. At this point you've replaced the default textures with your new ones. To reflect this change hover over Phong1 and right click drag down to the left to "Refresh Swatch". This will refresh the files it has loaded to your new ones. Assign Phong1 to your new mesh. To do this, select your mesh in the main viewport, and right click drag up while hovering over Phong1 to select "Assign X to Selection". 5. We need to adjust our pivot positions before step 6. 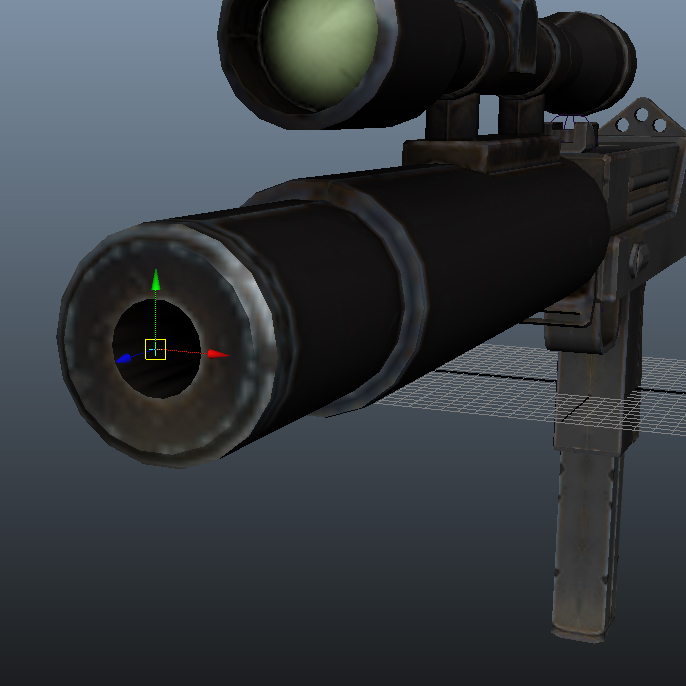 For the main weapon mesh the pivot needs to be set at origin. (0, 0, 0) Press Insert while your mesh is selected, and you can move around the pivot. Hold X while middle mouse dragging on the grid. Set it to the middle of the grid. The clip pivot should be set at the same position as the "gunmag_handle" tag. You likely have not adjusted where your attachment tags are yet. (Detailed in step 11.) But take a look at the pivot locations for the template's clip and you can get a good idea of where it should be. 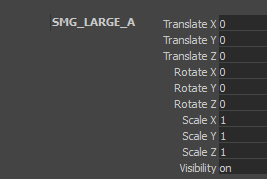 Values for the SMG_LARGE_A mesh. DO NOT FREEZE YOUR TRANSLATE VALUES for Clips / Projectile meshes. The attachment tag for the clips and the pivot need to be the same, as well as their translate values. This means in world space, exact same. Below you see that my clip is 8.56 in X and 15.543 in Z. The converter uses the translate values of the mesh and the clip attachment tag to locate their position in space. So for these just freeze their scale and rotation values. 8. We now need to separate the default mesh from its bones, and while doing this we will also delete any construction history for your new mesh. Select Edit > Delete All By Type > History. At this point you want to delete the template mesh. Before you do though, make sure you have their names copied to your new mesh(s). 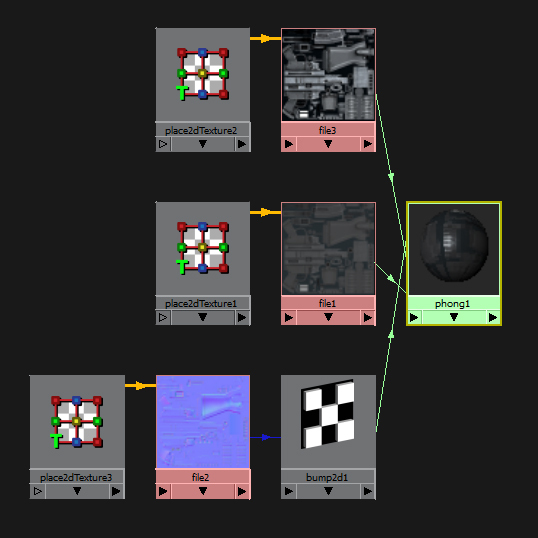 (Maya will append a 1 to an object with an identical name to another object in the scene. Just remember to delete the 1 after you delete the original.) Delete the template mesh(s). 10. Skin Weight Time! The skin weights it assigned to your bones need to be changed. Select your bone, and then mesh. Then select the Paint Skin Weights Tool. Your weights will probably look something like this. White = Full influence over vertices. Black = No Influence. Set your opacity and value to 1.0 and hit flood. This will make your mesh look like the picture below. 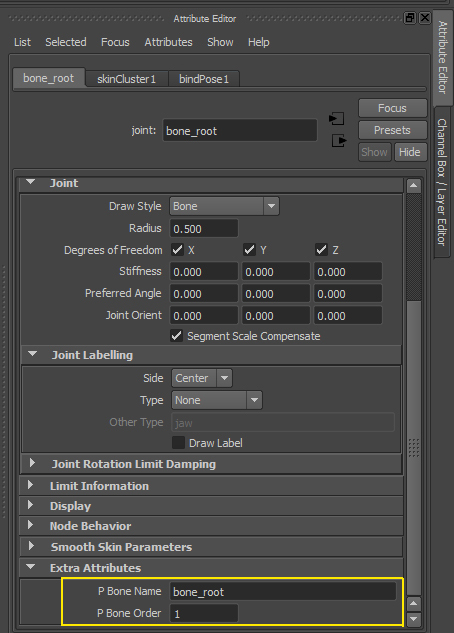 Now select your other bones and flood them with a value and opacity of 0. Do this for each bone that isn't 'bone_root'. This will turn the entire model black which is what we want. After you've done this, select all the vertices of the area you want affected by each bone. Then go back into the paint weights tool and flood these areas with a value and opacity of one. On the right you can see an example of the pump shotguns weights for the pump bone. 11. Now your weights are set correctly. All that’s left is to make sure your attachment tags are in the right spot. 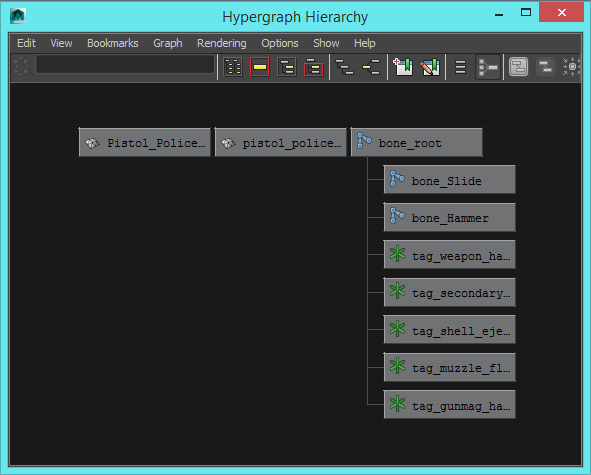 Select them via the Hypergraph > Hierarchy and move them to new spots if need be. Below you can see the muzzle flash locator I moved to a new spot on my new mesh. 12. Now it’s time to export! Make sure your Hypergraph looks like the template at the start. Go to File > Export All. Select FBX from the dropdown menu below. Now make sure your settings look like this picture. (Linked because of size.) Make sure you are exporting to your copied template folder. 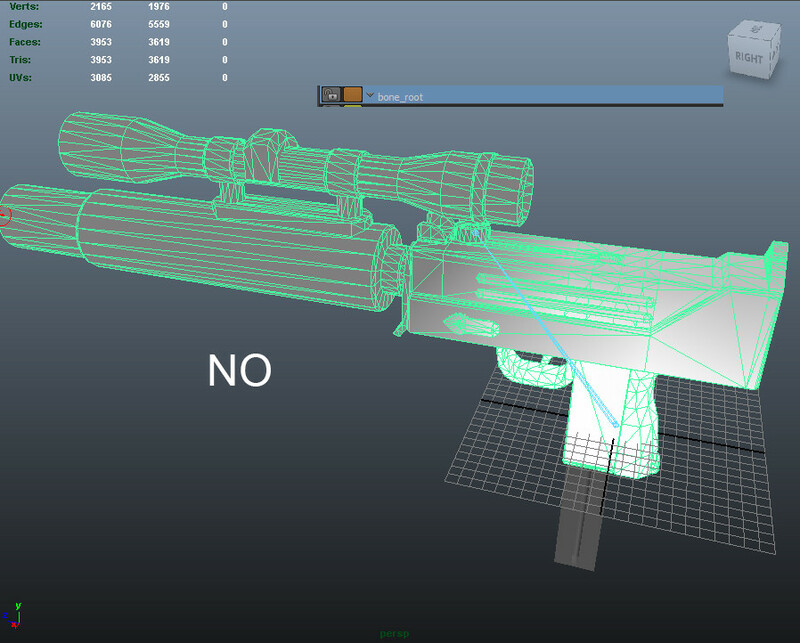 The FBX needs to be in the same directory as the textures assigned to it. I've created some video tutorials for those of you that prefer to see things visually. I probably don't explain the concepts as succinctly as the text based tutorial, so if theres anything in the videos you dont understand then I suggest reading the text guide in the post above. That FBX-SDK link leads to the Visual Studio version instead of the needed Python version. I couldn't get it to work with neither of them anyway. It's not able to find the module. I completely copied the VS and Python stuff over to side-packages. Which version of the python sdk did you download? Also, did you follow the link instructions for copying the sdk files to your local Python folder? Can you do the following if you are in Windows. This should print out all of the python module paths that python can see. Take a shot of that for me. Did you copy the folder "C:\Program Files\Autodesk\FBX\FBX Python SDK\2014.1\lib\Python26_x64" to "C:\Python26\lib\site-packages\"? What does that folder in windows look like "C:\Python26\lib\site-packages\"? Additionally, can you show me the python information after you hit return on "python"? You have seemingly different files that I can tell. You should only end up with these 3 files in there. The compiled FbxCommon file will get generated on its own though. I'd remove all the "*fbx*" files you have in there then copy these over.